Can we just take a second to talk about the fact that it was over 70 degrees in Nashville this past weekend? Leave it to Nashville to be covered in snow one week and then sunny and beautiful the next. Stephen and I both abandoned several of our chores so that we could just be outside and actually enjoy it a bit. The dogs prefer the snowy weather but I think that they were also appreciative for the many walks that they went on over the weekend. 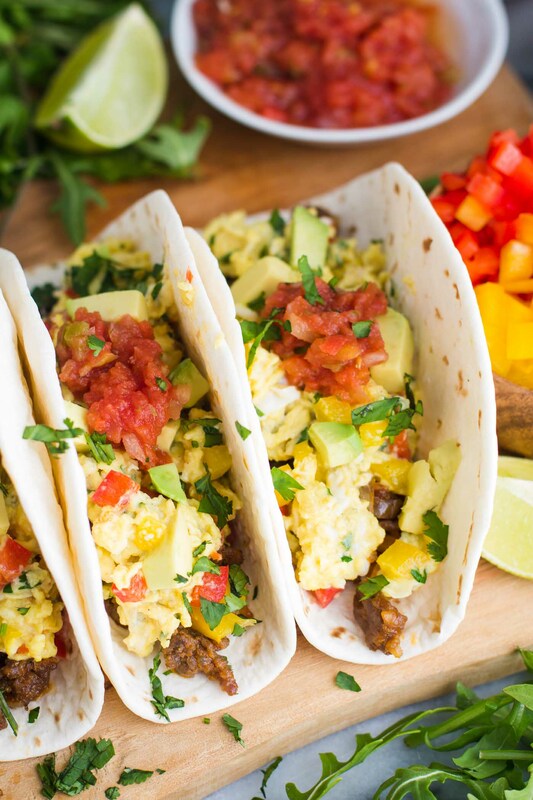 In other news: these BREAKFAST TACOS! I’ve been planning and dreaming of these tacos for quite a while now. I had so many ideas for some fancy tacos but in the end decided to keep it simple. Simple breakfast. 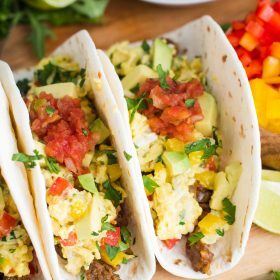 Simple tacos. I had also planned on them being vegetarian but seeing as I had a ridiculous amount of chorizo in the freezer (I really don’t know why) I decided to throw some of that into the mix as well. 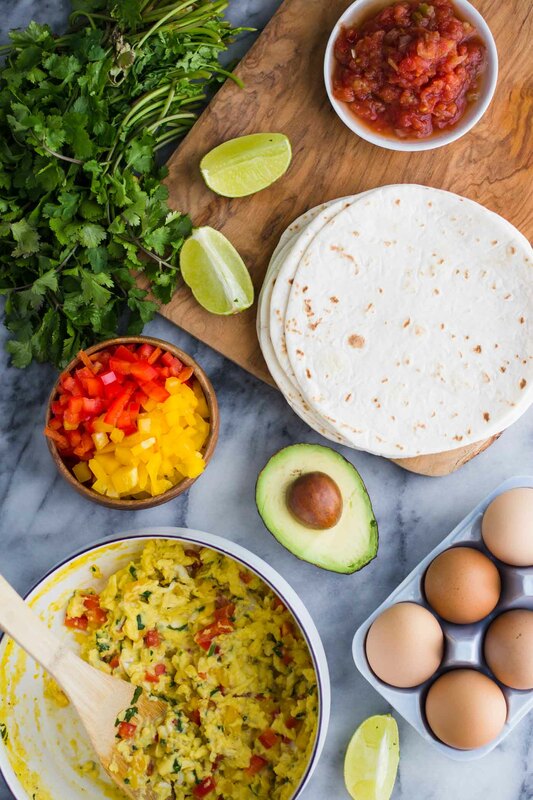 We’ve created lots of great breakfast remixes on the blog including breakfast pizza, breakfast quesadillas, breakfast nachos, breakfast toast cups, and even a one pan breakfast bake. Hopefully you know by now that I’m a huge fan of ‘throw an egg on it and call it breakfast’. 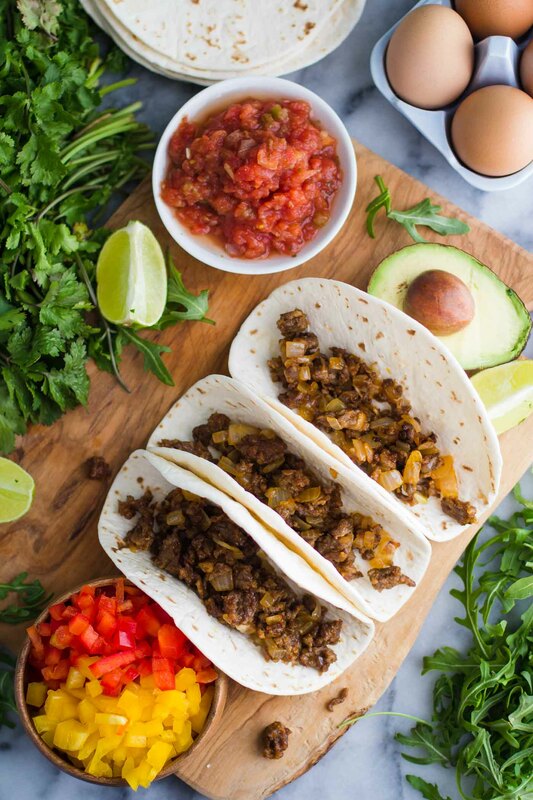 The ingredients of these tacos are also compliments of a shoot that I worked as a food stylist this past week. The company wanted their pictures to look like a “bountiful harvest” which means that I bought almost $100 of fruits and veggies for the shoot. It also included me buying EIGHT acorn squash for a particular part of the shoot. So, needless to say, you’ll be seeing lots of veggies on the blog over the next couple weeks since I’m determined not to waste any of it. 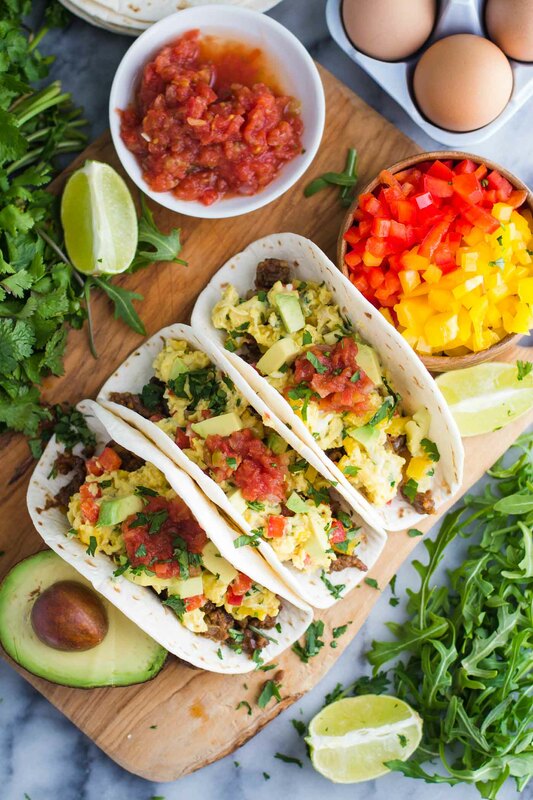 For these breakfast tacos, we simply sauteed some onion in with the chorizo and scrambled some eggs and threw in some bell peppers and a bit of chopped cilantro. Then we put it all in a tortilla, topped it with some salsa and avocado, and called it a day. We want to feel fancy with these tacos without actually having to put in too much effort. 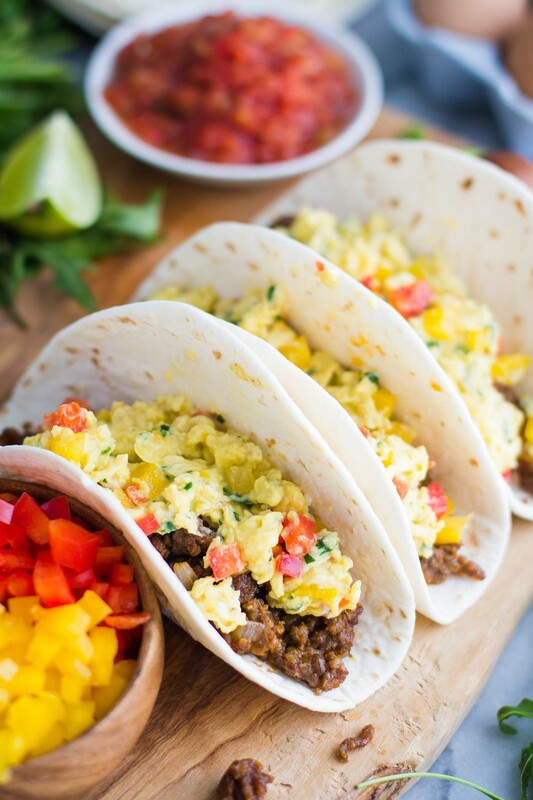 If you’ve never tried out Breakfast Tacos, I’m here to attest that they are DELICIOUS and you should put them on your “recipes to try” list right NOW. In a large skillet, heat the oil over medium heat and add in the onion. Sautee for one minute and then add in the chorizo. Cook until the chorizo is cooked all the way through. In a bowl, whisk together your eggs and milk. Lightly grease a medium sized pot and heat over medium heat. Add in the eggs and scramble for one minute. Stir in the bell pepper and the cilantro and continue to cook for an additional minute or until the eggs are scrambled to your liking. 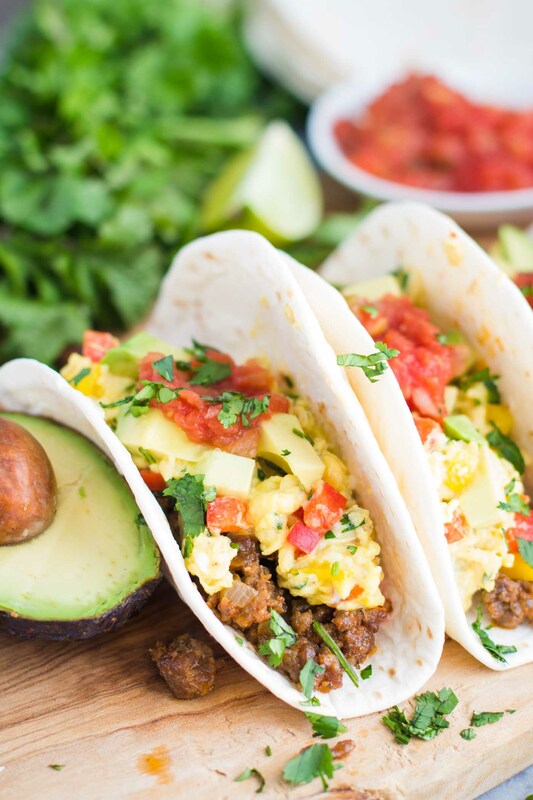 Assemble the tacos by filling each tortilla with chorizo and the scrambled egg mixture and then topping it with avocado, salsa, and any other yummy taco fillings that you prefer. Next Post » January Smoothie Round Up + $1000 Amazon Giveaway! I have some spare tortillas – this looks a good way to use them! I am so glad you stopped by my website! My husband and I discussed needing to branch out into healthier recipes just last night. Perfect timing. These tacos look delicious. I can’t wait to try them and get some other recipes.